HMAS Air Save was one of 21 air/sea rescue vessels originally built in the USA and Canada between 1943 and 1945, and transferred to the RAN under the Lend-Lease Agreement. These vessels were originally designed as anti-submarine craft but their high speed and manoeuvrability made them ideal as search and rescue vessels. In this role, their hulls were painted black and their upper decks and superstructure painted bright yellow. One vessel, HMAS Air Sprite, was built locally in 1960 to an almost identical design. Air Save was commissioned on 20 September 1944 in Sydney under the command of Skipper (later Sub-Lieutenant, RANVR) Charles Graham and officially listed as a tender to HMAS Rushcutter, and later to HMAS Madang. She remained alongside in Sydney preparing for sea until 1 March 1945 when she proceeded to Jervis Bay. On 10 March, she began a voyage northwards bound for Morotai, Indonesia, in company with HMAS Air Mist. Following a maintenance period at Alexishafen, Air Save was back at sea at the end of May, en route from Madang to Aitape, when engine defects, common to this class of vessel, forced her return, under tow, to Alexishafen for an overhaul of both engines. Additional defects discovered during the course of the overhaul kept her alongside at Alexishafen until July. She finally arrived at Morotai on 21 July and conducted ASR duties there for the next five months. Air Save’s return to Australia began on 24 December 1945 when she was taken in tow by HMAS Gawler in tandem with a 10-ton ammunition lighter. The vessels arrived in Brisbane on 2 February 1946 following a problematic passage during which Air Save’s tow line parted several times and she continually took on water. She decommissioned at Brisbane on 18 September 1946 and transferred to the RAAF in 1949. Air Save was transferred back to the RAN on 20 November 1962 and renamed Air Nymph. 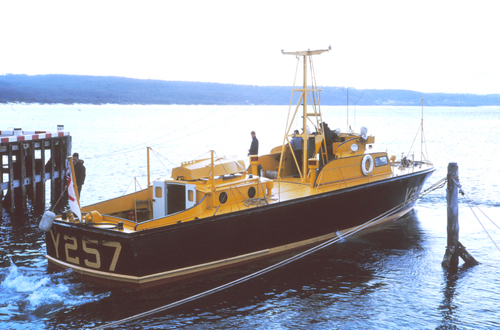 She was based at HMAS Creswell in Jervis Bay as a search and rescue vessel and later as a miscellaneous auxiliary. On the night of Monday, 10th February 1964, the aircraft carrier HMAS Melbourne (II) collided with the destroyer HMAS Voyager (II) while engaged in night flying exercises off the New South Wales coast. The impact pushed Voyager bodily through the water for a few seconds, and then she broke in two. Her forward section passed down Melbourne's port side, and the stern section down the starboard side. The forward section sank soon afterwards and the after section about three hours later. The disaster resulted in the loss of 82 lives (14 officers, including the commanding officer, 67 sailors and one civilian dockyard employee). There were 232 survivors. Melbourne was damaged but sustained no casualties. The search and rescue vessels were Air Sprite and Air Nymph. These vessels are specially designed for search and rescue purposes. They are 73 feet (sic) in length and have a speed of up to 28 knots although they usually cruise at 23 knots. They were moored at the Marine Section of HMAS Creswell, Jervis Bay, for the purpose of carrying out any rescue operations connected with aircraft operating from the Naval Air Station, HMAS Albatross. They were at readiness at the time of the collision. The siren alerting the vessels was sounded at 21:05 hours and Air Nymph left Jervis Bay two minutes later. She arrived on the scene at about 22:15 hours, Air Sprite arriving five minutes later. Within 30 to 40 minutes after the collision, Mebourne's sea boat and motor boat had picked up about 50 men from the water. Those were men who had nothing, or nothing substantial, to support them, and comprised those who were either thrown into the sea on impact, or who came through holes or escape hatches shortly thereafter. Those who were not taken straight from the water into boats made their way to life rafts or other substantial objects from which they were later taken by [the] search and rescue vessels or by Melbourne's boats. In some cases the rafts themselves were towed by boats to Melbourne's side, and the men clambered up scrambling nets on to the ship. [Air Nymph having plucked numerous survivors from the water] proceeded to Melbourne and attempted on two occasions to come alongside, but, because of the heavy swell, this was impracticable. She [consequenlty] returned to Jervis Bay with 34 survivors and arrived there at approximately 01:00 hours on 11th February. After the survivors had been taken off the vessel, she refuelled and returned to the scene, reaching there at about 0300 hours. Because the set had taken the datum further to the south, the return involved a journey of 1¾ hours. Air Nymph took part in the search which was then under the supervision of HMAS Stuart. A search plan had been drawn up and Stuart instructed Air Nymph to cover the south eastern sector of the plan. On searching this sector Air Nymph recovered articles from Voyager, but did not find any further survivors. The search continued until approximately 08:00 hours when Air Nymph’s shortage of fuel necessitated her return to Jervis Bay. Under the command of Lieutenant [George R] Paul [RNZN], Air Nymph again left Jervis Bay at 11:35 hours, arriving in the search area at about 14:30 hours. She continued to search until 18:00 hours without result and was then ordered to return to base. Air Sprite was under the command of Sub Lieutenant [Anthony D] Vodic [RAN]. On hearing the siren he hurried to the Marine Section of HMAS Creswell and took command of the vessel which was the stand-by rescue craft. He proceeded to the scene of the collision at 23 knots arriving there at 22:20 hours. Some time after, Air Sprite approached the life raft of which Petty Officer [Douglas] Moore had taken charge, and recovered the survivors who numbered 36. She approached Melbourne, reported the number of survivors and was then ordered to return to Jervis Bay. After the survivors had been taken ashore, and Air Sprite refuelled, she slipped from the jetty at 02:15 hours and proceeded back to the search area. On arrival at approximately 04:00 hours she was ordered by Stuart to search in the north eastern sector. The search continued in this sector until approximately 05:30 hours when Air Sprite was instructed to investigate life rafts and recover any survivors. No survivors were sighted. Air Sprite returned to Jervis Bay, arriving there at 10:40 hours. A fresh crew took over and the craft left at 11:35 hours under the command of Lieutenant [Eric] Mentz [RAN]. Air Sprite arrived at the datum at approximately 14:00 hours. Stuart instructed her along with Air Nymph to carry out a search around the datum at a 10 miles radius, Air Sprite taking the southern half and Air Nymph taking the northern half. Air Sprite made one complete box search of its area without result. The search was discontinued at 18:00 hours when Air Sprite returned to Jervis Bay, arriving there at approximately 22:40 hours. The efforts of both Air Nymph and Air Sprite came at a cruicial juncture during the rescue operation. Their timely arrival relieved the stress on Melbourne's boats whose crews were struggling to assist the Voyager men still in the water. Many survivors owed their lives to the efforts or the two air sea rescue vessels. The crews acted promptly, efficiently and with courage in an extremely challenging and traumatic situation to rescue 70 survivors from teh sea, and from life rafts, following the collision. On a number of occasions, crew members courageously leapt from the search and rescue vessels into the oil-covered water to pull survivors from among the debris. The exemplary efforts of both crews undoubtedly prevented further loss of life. The outstanding professionalism and courage of the crews are of the highest order and in the finest traditions of the RAN. All crew members excelled in the performance of their duties, without complaint and, until today, have never been formally recognised for their outstanding devotion to duty under extreme circumstances. Air Nymph remained in service at Creswell as a miscellaneous auxiliary for a further four years. She was sold on 20 June 1968. A general arrangement plan of the Air class search and rescue vessels.